ANNOUCING NEW COLOR BOOTCAMP COMING SOON! The Business Camp is $750.00 or $99 a class. LaQue's Corporate Training Academy Business Boot Camp is a great opportunity to take time out of your career, get motivated, inspired, and build a platform for future success. It’s great for new cosmetology graduates who want a jump on the competition, and stylists who are keen to refresh and improve their skill-set. 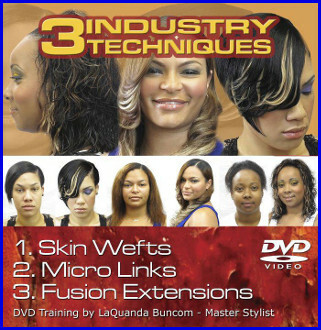 The Hair Extension Camp is $2,000 and it’s a 3 week course, or $250.00 per class. Today, hair extension services are still the fastest growing category in the professional industry and have proven to withstand the test of global economic challenge, trend and social acceptance. Although you may be a licensed cosmetologist, stylist should still attend these bootcamps and training seminars to improve their skill and stay up to date on the latest industry techniques and trends. There’s always a newer, quicker, easier styling technique to learn about, not to mention the industry is always changing. A cosmetology s needs to always stay updated on the latest hair applications "Stylist never stop learning.” LaQues Corporate Training Academy is dedicated to staying on top of the latest trends this means that students learning how to do hair extension techniques at Laques Corporate Training Academy are always learning the most modern methods possible. Our objective is to give students the best foundation possible, so that once they go out into the world, they will be competitive in the cosmetology industry. DON'T WAIT!! Space is limited, register today and JUMPSTART your business!!! Register Now! will feel more confident in your ability to handle the entire hair experience!